Looking stylish and feeling warm when the weather drops down to the single digits always proves to be a hard, if not impossible, feat to master. 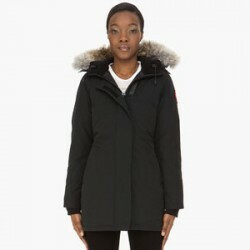 Sometimes no matter how much you layer under your coat, there is no substitution for a truly warm parka. Not all parkas are the same. Some are truly more equipped at keeping you toasty and fashionable…for a hefty price, of course. Earrings used to be my thing. I’m not sure at what point over the last couple of years I stopped investing any attention to adorning my ear lobs but I do know that these in-your-face Givenchy disk number are bringing earrings back – for me – in a huge way. This new yearning for these updated hoops comes courtesy of this lovely shot of model Ming Xi in Vogue China. 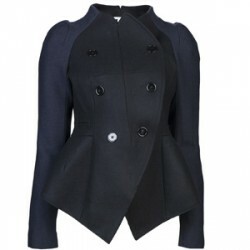 This sharp two tone, navy and black, wool Carven coat ($865) has been stalking me since I came across it at Farfetch.com. I then spied two women wearing it at an event last week and fell in love with the jacket. I love the structured tailored fit that accentuates the waistline, the round neck and the curved hem and tonal stitching that gives the illusion of a peplum hem. The knee high-boot is fall’s comeback kid. 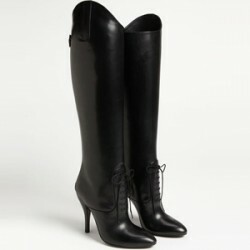 Once a star player in every woman’s wardrobe, the knee-high boot was swiftly demoted to the back of the closet when the ankle bootie came around. We’d pull them out on occasion, but let’s face it: while it may be a classic shoe, our attention has been focused on shorter styles. Filed under: Accessories, Covet, Shoes. These Bionda Castana Maya corset-style sandals are hard not to fall in love with as soon as you lay eyes on them. The striking bordeaux color, the always attractive cage style, the round retro toe and the all-over tiny stud detail come together to birth a show-stopping shoe. The line, helmed by London designers Jennifer Portman and Natalia Barbieri, is known for its seriously feminine and glamorous shoes adorned with hardware details. Filed under: Covet, Featured, Shoes. Basso & Brooke lend their jaw-dropping dizzying digital prints to Cambridge Satchel Company this fall. The result is a decorative capsule collection of bags that feature a mélange of intricate and explosive prints that will surely get you noticed. I can stare at these printed bags all day! Want to get your hands on these kaleidoscopic beauties? Filed under: Accessories, Covet, Featured.